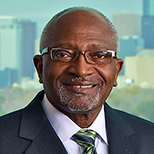 Robert D. Bullard is the dean of the Barbara Jordan-Mickey Leland School of Public Affairs at Texas Southern University in Houston, Texas. He is often described as the father of environmental justice. Professor Bullard received his Ph.D. degree from Iowa State University. He is the author of seventeen books that address sustainable development, environmental racism, urban land use, industrial facility siting, community reinvestment, housing, transportation, climate justice, emergency response, smart growth, and regional equity. Professor Bullard was featured in the July 2007 CNN People You Should Know, Bullard: Green Issue is Black and White. In 2008, Newsweek named him one of 13 Environmental Leaders of the Century. And that same year, Co-op America honored him with its Building Economic Alternatives Award.